Environnement PH sees to the removal of all types of underground tanks. Our team plans and conducts works according to regulations so that all dismantling-related procedures are respected. The work is done in accordance with safety and environmental standards. Thanks to our expertise in this field, you can rest assured that no contamination will occur during the removal of buried tanks. The removal of an underground tank requires several precautions so the dismantling is done properly without creating or aggravating petroleum hydrocarbon contamination problems. 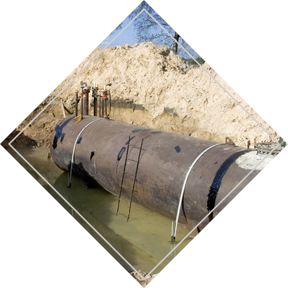 In some cases, the legal aspect must also be considered before a buried tank can be dismantled. Is the tank still used or is it abandoned? What product was the tank intended to contain? What are the tank dimensions or capacity? Is the tank licensed as a petroleum equipment by the Régie du bâtiment du Québec (RBQ)? Is the tank equipped with a cathodic protection against corrosion? It is possible that oil tanks for heating buildings have been abandoned in the ground when the heating mode was replaced. When a new owner finds out an abandoned oil tank on their property, a legal redress is often considered. Under these circumstances, a legal notice may be in order before any intervention takes place on the site. A poorly planned and rushed dismantling intervention could make you miss out on any opportunity to seek redress from the previous owner! Call us! We will help you make sense of things. A tank which still contains liquid does not necessarily mean that it is not perforated, even if it is full. Several reasons can explain such a situation and contradict this often false assumption. Did you know that some underground tanks are subject to the issuance of a licence from the Régie du bâtiment du Québec? Did you know that the presence of a petroleum contractor licensed by the Régie du bâtiment du Québec (RBQ) and a certified auditor is necessary during the removal of buried tanks that are recorded with the RBQ? Did you know that the law requires a sampling of soils to look for signs of contamination during the dismantling of any underground tank? Did you know that a buried tank that leaked near a building poses a significant risk of hydrocarbons seeping into the building’s foundation drains and even under the building? In such cases, petroleum hydrocarbons may have contaminated a surprisingly large area, which may result in significant soil decontamination costs. Contact us. We will gladly provide you with advice and solutions to your problems. Environnement PH inc. is an environment consulting firm that has been operating since 2002 in various areas of environmental management, including environmental site assessment, soil and groundwater environmental characterization and decontamination of contaminated sites. We serve Eastern Townships, Montérégie, Montreal, Central Quebec, Capitale-Nationale, Mauricie, Chaudière-Appalaches, Laval, Lanaudière and Laurentian regions.